Qamdo Bamda Airport also known as Changdu Bangda Airport, is an airport serving Qamdo (Changdu), Tibet, China. It is located in the village of Bamda (Bangda). It's runaways length 5,500m/18,045ft. Zhukovsky Airfield also known as Ramenskoye Airport or Zhukovsky Airport, is Moscow's fourth international airport. It is located in Moscow Oblast, Russia located 40 km southeast of center Moscow in the town of Zhukovsky. It's runaways length 5,402m/17,723ft. Hamid Karzai International Airport is located 5 kilometers from the city center of Kabul in Afghanistan. It serves as one of the nation's main international airports and as one of the largest military bases, capable of housing over one hundred aircraft. It's runaways length 5,400m/17,717ft. Istres-Le Tubé Air Base is a large multi-role tasked French Air Force base located near Istres, northwest of Marseille, France. The airport facilities are also known as Istres - Le Tubé (ICAO airport code: LFMI). It's runaways length 5,000m/16,404ft. Ulyanovsk Vostochny Airport is an airport in Russia located 17 mile northeast of Ulyanovsk in Russia. 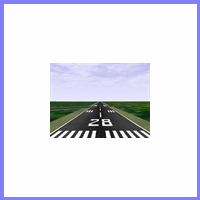 Its runway is the third longest public use runway in the world with a length of 5,000m (16,000 ft). The runway is also the widest, with a total width of about 105 metres (344 ft). Xigazê Peace Airport is a dual-use military and civilian airport serving Xigazê, the second largest city in Tibet Autonomous Region, China. It is located in Jiangdang Township, 43 kilometers from Xigazê. Situated at an elevation of 3,782 metres (12,408 ft), it is one of the highest airports in the world. It's runaways length 5,000m/16,404ft. Embraer Unidade Gavião Peixoto Airport (ICAO: SBGP) is a private airport located near Gavião Peixoto, Brazil. It is owned and operated by Embraer and used as for testing civil and military aircraft. It's runaways length 4,967m/16,296ft. Upington Airport is an airport located in Upington, Northern Cape, South Africa. At 4900 metres, runway 17/35 is one of the longest runways in the world. The high elevation of the airport, extremely high summer temperatures and the fact that it was designed for the Boeing 747. It's runaways length 4,900m/16,076ft. Denver International Airport often referred to as DIA, is an airport in Denver, Colorado, United States. At 33,531 acres (52.4 sq mi), it is the largest airport in the United States by total land area. Runway 16R/34L, with a length of 16,000 feet (4,877 m), is the longest public use runway in the United States. Hamad International Airport is the international airport for Doha, the capital city of Qatar. It replaced the former Doha International Airport as Qatar's airport. It's runaways length 4,850m/15,912ft.